Halloween has always been a big thing in our family as we take every excuse to dress up. Perfect opportunity to unleash the artist within. There are so many ideas in my head but so little time for this year so be sure to be back next year as there will be even more cool freebies (board games, activity sheets, memory games…). Two pages of witch’s cauldrons and a page of spooky eyes. The idea behind this game is to brew a witch’s potion – each cauldron needs a specific number of ingredients (eyes) in it. You could use candies instead of eyes to give some incentive – when the game is finished the candy is theirs for the taking. A pumpkin patch full of simple math (addition & subtraction) problems. At the moment we only have addition but more math sheets will follow! At the moment this game only has the board but if there will be a demand ;). I will expand the game with activity cards (I was thinking about question cards – maths mainly, and simple even cards – like move 3 places forward). At the moment the essence of this game is the Halloween theme and two special fields – ghost and bat. I thought it would go something like this – if you land on the ghost you throw the dice again and move forward and if you land on the bad you roll the dice again and move backwards. 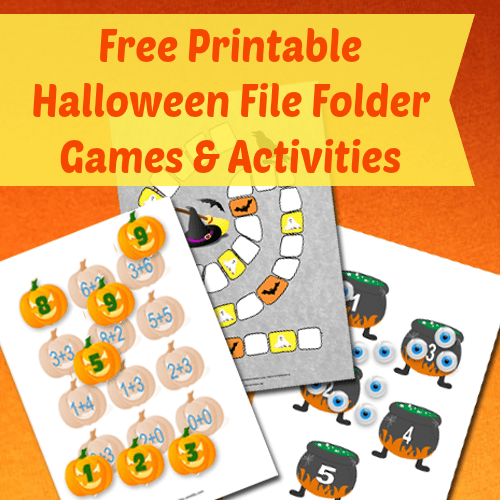 Get you free printable Halloween File Folder Games here.